I Love Cartoons! Show on May 19th at TAG Hulett Hall!! Come to the first of a series (?) of screenings at the Hulett Hall at the Animation Guild’s building at 1105 N. Hollywood Way in Burbank, CA 91505. The program is called “I Love Cartoons” and features cartoon 16mm films that are especially beloved by me and hopefully, all of you. I’m presenting two stills from some of the cartoons we’re running, I’m sure you can guess the first one, the second one is from a Cigar TV commercial, animated by a great animator who should be more famous than he is. The show will be about two hours in length and starts at 6:30 PM, ends about 9:30 PM or so. 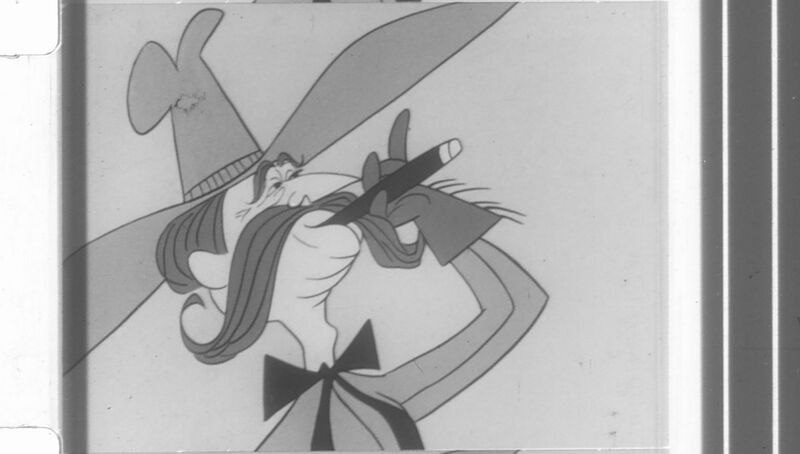 It’s in four half-hour installments, “Newsreel Theatre, or Cartoons At Random”, four cartoons picked off the shelf that I love, “Eastern and Western European Favorites”, these include such cartoons as the Soyuzmultfilm production: “The Four Friends”, “Tup-Tup” Nedeljko Dragic’s Zagreb masterpiece and a Halas and Batchelor “Barnaby” cartoon, adapted from the Crockett Johnson comic strip. The third half-hour is devoted to 1950s Television cartooning, featuring a whole reel of our mystery animator’s work, a Tom Terrific serial called “Snowy Picture”, with animation by Jim Tyer and directed by Gene Deitch, plus a reel devoted to the Ford Dog campaign of the late 1950s, animated principally by Bill Littlejohn for Playhouse Pictures. 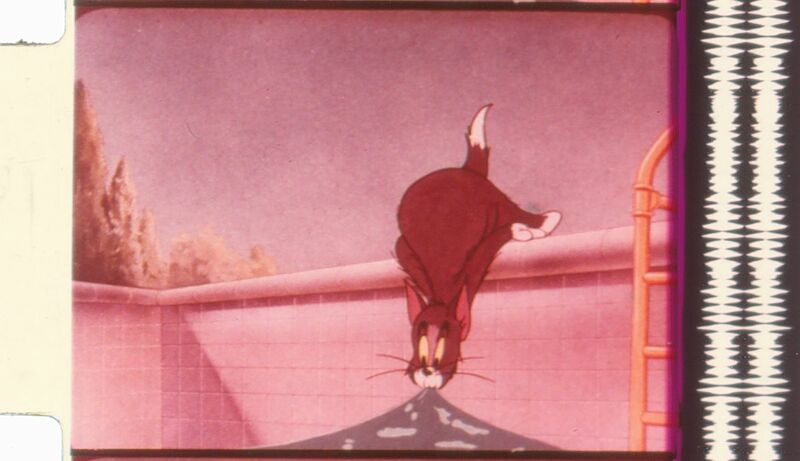 The fourth and last half-hour is devoted to the “Cartoon Western”, animated versions of the typical B-Western plots. These may have been shown at “The Hitching Post”, a legendary Hollywood theater devoted to Westerns back in the 1940s and 1950s. This program promises to be fun and as lecture-free as possible. Come and enjoy beloved cartoons with an audience! 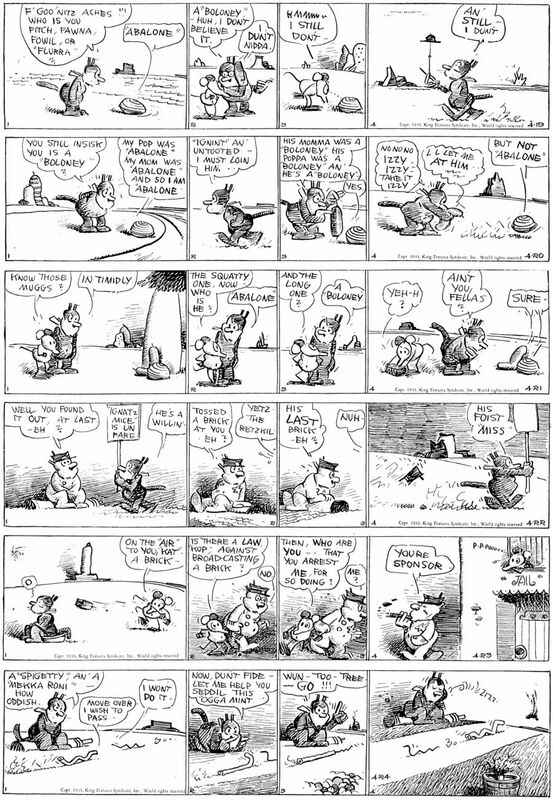 Krazy this time is from 4-19 to 4-24-1943, the 4-23 strip is courtesy of Gerd Heinlein, the man with 20,000 comic strips in his collection. Thanks for this one, Gerd! Herriman spins three days of comedy out of a play on words involving “Abalone” and “A Baloney”, and also features a piece of “Mekka Roni” and “Spigetty” passing through each other on a Coconino highway. Myrtle is from 1-10 to 1-16-1949. I want to point out the 1-11 as Myrtle and Sampson have a spat, and wind up with free ice cream cones; it pays to fight? I also love the little pose in the 1-12 as Myrtle grabs the sides of her hat and pulls them down over her head. The Sunday page is great fun as Myrtle’s family is visited by the FBI, no, not Jim Comey. Felix is from 4-9 to 4-15-1933. In the 4-9 Sunday page, Felix starts a dream journey to prehistoric times, in the dailies, Felix is still a little jealous of Danny Dooit’s fame and all the fan letters and press he seems to be getting. I like the 4-15 as Felix hides in a box to escape a bulldog and Danny thinks Felix is a gift! Thanks for reading my blog, if you want to write to me, my address is kausler@att.net. I’m sorry the comments continue to be disabled, I can’t figure out how to restore the blog to full capacity, so have to settle for what I have. Maybe I’ll see you at the “I Love Cartoons” show at 6:30 PM, Friday, May 19th, at the Animation Guild’s Hulett Hall, 1105 N. Hollywood Way, Burbank Ca 91505. You are currently browsing the Mark Kausler's CatBlog blog archives for May, 2017.